I can't remember the last time I did an outfit post in jeans, so today felt like an appropriate time to switch it up. Jeans have never been my favorite, even before I was pregnant, as I find them restricting and uncomfortable. I feel so much more comfortable in dresses and skirts. Not to mention, the bigger I get the more important dressing for comfort seems to be. I love this shirt! I splurged at Motherhood Maternity for it a few months ago knowing it would be a staple in my wardrobe. I can dress it up or dress it down because of the lace which makes it wearable with anything. I've been scouring the clearance racks at Target and came up with a few more pieces for my growing body. I can't wait to share them with you! That shirt is definitely a great piece! Perfect for warmer temps now and layering later! 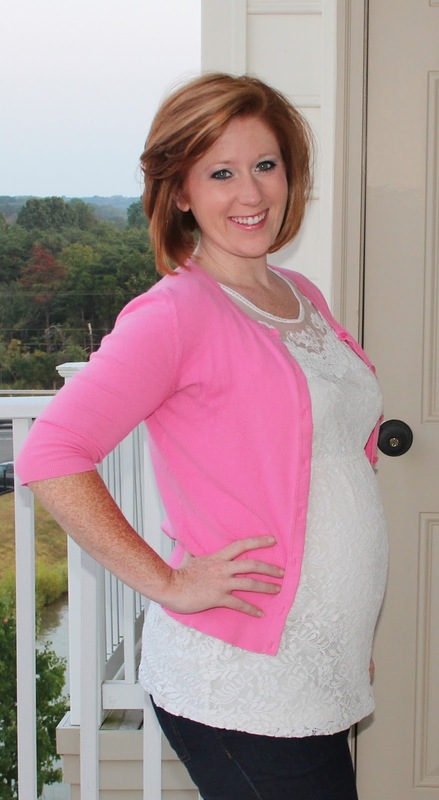 I'm still wearing lots of my maternity tanks with sweaters and cardis as fall approaches! Target has some super cute maternity clothes. I love your haircut, btw! Cute outfit! That top is so great... it will transition into fall so well too! Definitely a fun splurge! You look so cute. I love the pink with the lace.